When I chose Sylvaine Delacourte Florentina to review, I didn’t know Kevin had already served it papers in his review of the line’s Helicriss, where he called Florentina “the most insufferable of the bunch” of the house’s releases. I understand that. If you don’t like powder and musk, you might well loathe Florentina. Me? I’m a fan. 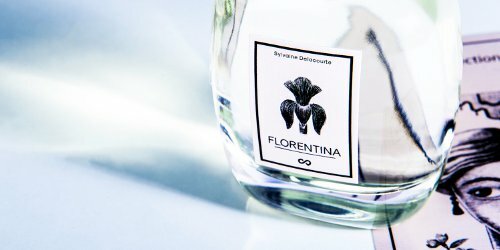 I love a silky soft, swan’s-down puff of a perfume, and Florentina is all about that. To me, its musk is more about texture and body than about cleaning products. Take this as a commendation or condemnation, depending on where you sit, but Florentina has now unseated Lorenzo Villoresi Alamut as my favorite “comfort-me-with-powder” scent. Florentina’s notes include almond, iris, heliotrope, white musk, carnation and vetiver. I first sniffed Florentina with Denyse from Grain de Musc. “This reminds me of [Guerlain] L’Heure Bleue,” I said. She replied, “L’Heure Bleue with the sad parts taken out.” That’s about as accurate a description of the fragrance as can be delivered in a sentence. Florentina is a powdery iris scent with a touch of pastry cream. At first, it’s slightly green, but it plunges straight into ladies’ powder — no baby powder about it — infused with dry iris. This isn’t the juicy iris that hints of violets and lipstick. It’s an aristocratic, powdery iris that Proust’s heroines would have loved. Its powder is finely ground enough to hint of buttercream transformed into vapor, as airy as warm breath on chinchilla fur. Which brings us to the scary word, “musk.” Some musks smell like detergent to me. I don’t like a fragrance that reminds me of cleaning toilets. Add orange blossom, and the same kinds of musk recall powder room soaps shaped like pansies. To me, Florentina goes nowhere near the laundry room. Musk can fill another role in perfumery, to add texture and marry materials. That’s the role I feel musk chiefly plays here. Here, musk is the feathers in the feather bed on a carved walnut Victorian frame with old linen sheets. Florentina has moderate sillage and terrific longevity. A few spritzes before breakfast burn quietly until bedtime. As Florentina wears, it pulls closer to the skin, but it doesn’t really change character much. Florentina isn’t freaky or challenging. If Florentina suits you, you won’t have to work to like it. That’s not what it’s about. Florentina’s charms are basic: fancy iris powder with almonds and cream. Maybe you love L’Heure Bleue’s sad parts. I do. That’s a huge part of its attraction. But I have room for pretty, contenting fragrances in my perfume cabinet, too, right next to the peach satin slippers with maribou puffs. Sylvaine Delacourte Florentina Eau de Parfum is $160 for 100 ml. In the US, you can find it at Luckyscent or Indigo Perfumery. Sounds lovely. I love me some powder notes. I can’t imagine why this line is advertised as centering around white musks but Delacourte is no fool. Funny you mention musks. In all of the vintage 80’s perfumes I’ve collected, they tend to dry down to drier sheet musk (original Chloe) or dirty hair musk (original Oscar de la Renta). Musks really do make or break a scent. I’m no perfumer by a long shot, but I imagine musks to be some of the trickiest materials to worth with. They can affect a fragrance so many ways! “Money saved” is my go-to phrase, too, when I’m not wild about a fragrance. It really is a good thing! I haven’t smelled any of the others in the set, but I do like this one. Then again, I’m a sucker for a powdery perfume–sometimes I crave them. The bottle really is nice! It feels solid and curvy in the hand. Ok, ordered the discovery box! It will be interesting to see what the other fragrances are like! Angela, I am going through the discovery set, and I find Florentina exactly as you descried! I also agree on your musk characterization–this is a well done musk and no detergent close by. However, I think I fell in love with Helicriss. I grew up on the Mediterranean coast, and, until trying this fragrance, I wasn’t able to find an immortelle that smells exactly like the landscapes I am used to. This one makes me homesick. That’s so wonderful! (Not that you’re homesick, but that you found such an evocative fragrance.) I’m going to have to find a way to sniff it.